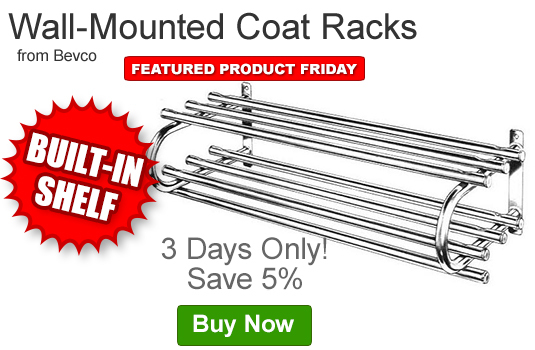 Save 5% off the Q Source price of Bevco’s Wall-Mounted Coat Racks. Our FPF060316 Coupon Code is auto applied when you add an eligible coat rack(s) to your shopping cart. This Featured Product Friday (FPF) promo is valid from today, June 3, 2016 through Sunday, June 5, 2016 and the code is unlimited use. These Bevco Wall-Mounted Coat Racks are manufactured from 1” round 18-gauge tubular steel, featured a single or double shelf (depending on model), and are made in the USA. For further questions about Featured Product Friday, please read our informational blog post, call us (800-966-6020), or send us an email. Please note: This promo is valid only at QSource.com and expires on June 5, 2016.